Well, I’ve spent the last week working on the stenciling and I’m quite pleased. The pattern is delicate and very Victorian, and the monochromatic palette is just perfect. As the stencil is so delicate, I’ve had to work in small batches, only doing 5-8 patterns at a time. I’ve only worked one wall completely, and I’m debating on doing more as I like the pattern so much and the rest of the fabrics will be solids (textures, but solids). Bill is in favor of me doing the whole room, but it is exhausting work. So for now, we’re starting with just the one wall. We’ll see what January brings. For his part, Bill has started the floor. We rented a huge floor sander and he spent 8 hours sanding the previously painted floor with 4 different levels of sand paper. One has to go in steps with sanding. You start with the heaviest grade and go down slowly. The grit on the initial sandpaper was like asphalt it was so heavy. Neither of us could believe that it was what would be needed, but sure enough, once Bill used it, we couldn’t have gotten by without it. I think that this room is truly the most difficult room in the house, due to all the plastering and sanding and wall removing we’ve had to do. Other rooms should be smoother. But, each comes with its challenges and cool discoveries. 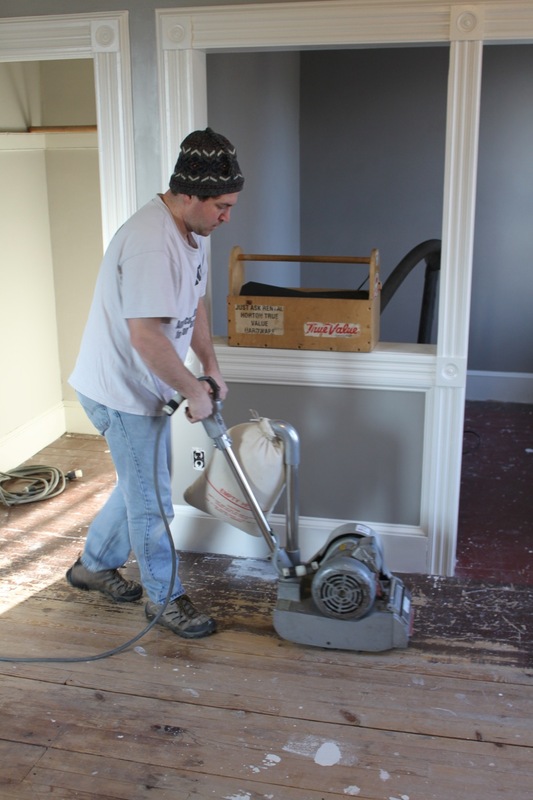 Once the main part of the floor was sanded, Bill rented and edger to get close to the walls. Unfortunately, this is a hands and knees sort of machine, but it tucks right in next to the woodwork. The pine floors smell amazing during and after the process. I can’t imagine how this house must have smelled when it was brand new. 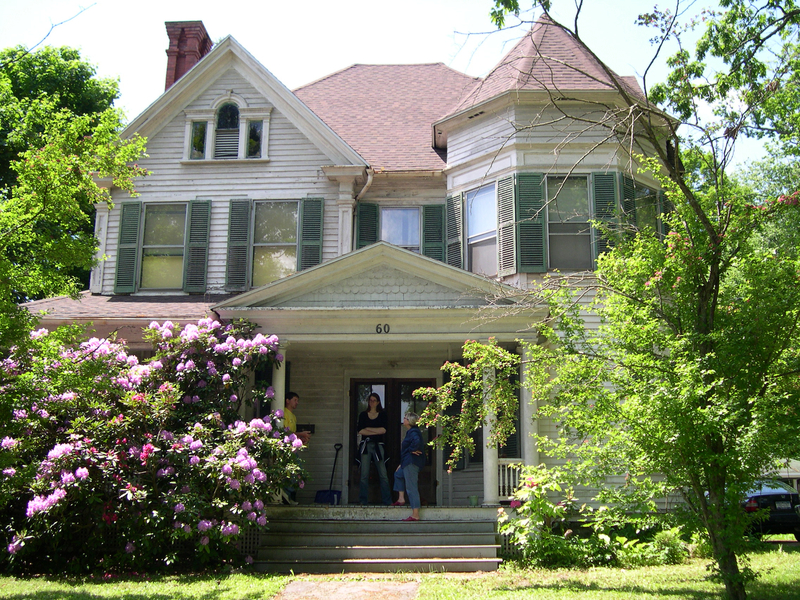 This house would have smelled of fresh pine and waxed cherry woods (at least, that is what I imagine.) Course, it could have smelled like coal and bad wallpaper paste. Now that the edges are smooth, Bill rented a second push sander, a pad sander. 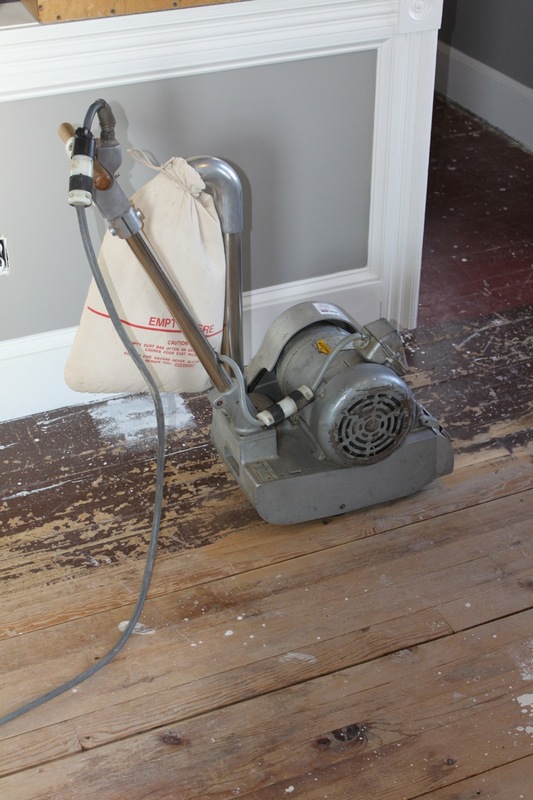 It was a newer machine and lighter “on its feet”, smoothing out any ridges that were left. We will likely be able to do most of the house with just this sander, but we’ll see as we get into each room. This is just our first test on the floors. Bill worked tirelessly on Sunday finishing the corners with a hand sander and then cleaning the dust out of the room. He was anxious to put our first coat of stain and oil on the floor. The weather was warmer yesterday, so we could vent the room properly. I didn’t go upstairs most of the day to avoid the fumes, but I peeked in on the room this morning. It is stunning. 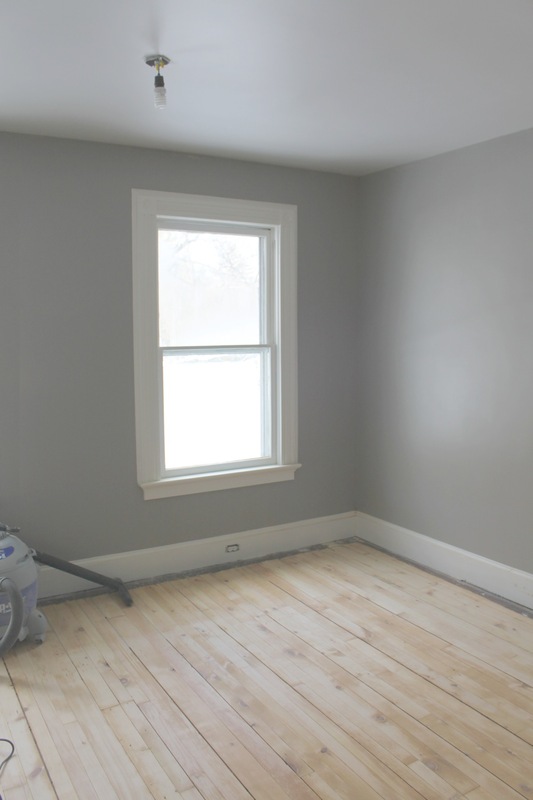 Bill is gifted and the original pine floors lend to a beautiful finish. We’ll put on several more coats of oil to finish over the next week/two weeks. Can’t wait to show you the final pics. wowza! amazing work, you guys! 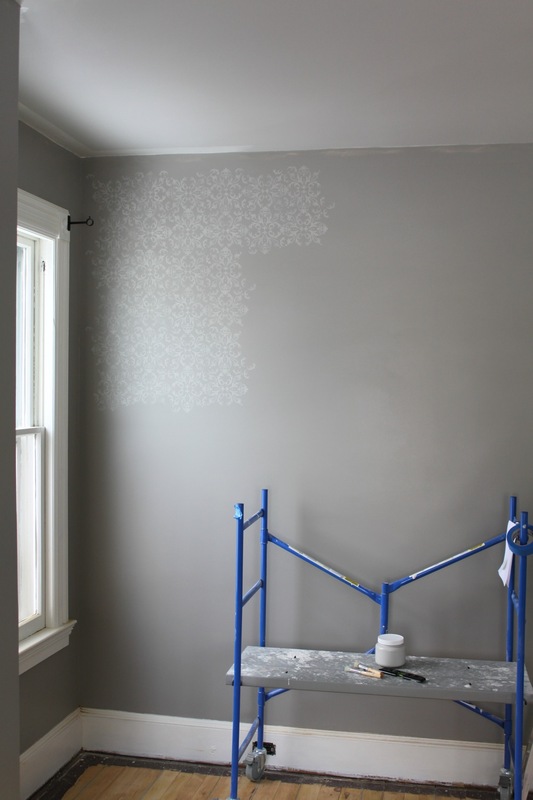 Karyn, the stenciling is beautiful and so perfect for the room! Your artistry is really coming into play here and I’m so glad you’re sharing it all with us. Those floors are going to be smashing, too. It’s good they haven’t been refinished much before, because the boards get thinner and thinner; at some point, you just can’t sand them again; you’re lucky they weren’t chintzy with materials in the Victorian era! Fantastic in person! You guys are amazing!! !